Two fae and a vampire move into your house, what do you do? Hide and spy on them, of course! 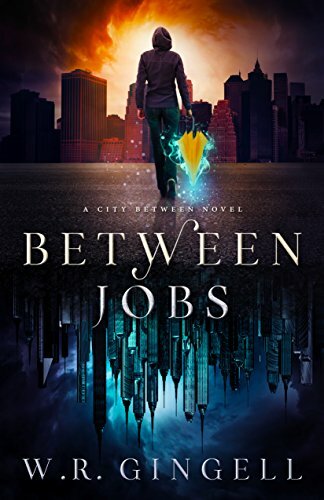 Loved, loved, loved Between Jobs (The City Between Book 1)! Pet, a 17-year-old squatter, has woken up to a murdered man strung up outside the window. It’s a brutal and vicious crime, and the police are taking an active interest in the grisly murder in an already strange neighborhood that’s hosted multiple murders. But the police are not the only ones investigating. There are three strangers – two fae and a vampire – stalking a serial killer, and they believe that this murder matches their killer’s M.O. Unfortunately, they decide to move into the house across the street from where the murdered man lived, not noticing the house is already occupied. The teen spies on the men, slipping in and out of the familiar house with ease until they notice a few too many hints that lead to the teen’s hidden bedroom built behind a bookcase. Rather than kill or wipe the memories of the teen, the odd trio make the teen their Pet. Capital P. No getting attached, no names, no personalizing pronouns, no nada. It’s just a Pet. And as long as Pet keeps quiet, makes their tea and coffee, and cooks their meals, they just might let it live. Of course, keeping their Pet alive means taking the teen along on missions and forays to further the trio’s investigation, trips to the grocery store, and other non-dangerous tasks. Oh, wait… Strike that non-dangerous part. As their investigation continues, the fae and vampire might discover there’s more hidden in the house than they imagined. Between Jobs is a frantically paced exhilarating read that I just couldn’t put down. (Don’t tell Gingell, but Between Jobs made me late for a coffee date with a BFF.) Just way too much fun, and the only negative to the book is that I have to wait for the next one. Rats! When you get up in the morning, the last thing you expect to see is a murdered guy hanging outside your window. Things like that tend to draw the attention of the local police, and when you’re squatting in your parents’ old house until you can afford to buy it, another thing you can’t afford is the attention of the cops. It’s not my real name, but it’s the only one you’re getting. Things like names are important these days. And it’s not so much that I’m Pet. A human pet: I belong to the two Behindkind fae and the pouty vampire who just moved into my house. It’s not weird, I promise—well, it is weird, yeah. But it’s not weird weird, you know?